What was the Universe like before 10-44 seconds? This question is one of the most important and vexing problems facing modern physics. Big Bang cosmology coupled with the Standard Model of particle physics provides an excellent description of the Universe regarding that question. But in order to go on will most likely require a radical theoretical shift. During the 1960s and 1970s physicists developed a theory to describe the interactions between particles in the standard model. The theory proposes that there is symmetry underlying the strong, weak, and electromagnetic forces. At sufficiently high energies, like those present in the early Universe, these three forces have the same strength and behave as a single unified force. At lower energies this symmetry is spontaneously broken and the three forces begin to take on their characteristic properties. For years, scientists hoped that a similar path would combine all four fundamental forces (strong, weak, electromagnetic, and gravitational), revealing a single "Theory of Everything" to govern the natural world. However, deep inconsistencies between General Relativity and Quantum Mechanics stood in the way, and it became increasingly clear that a totally new theory was needed. String theory, one of the most promising candidates, describes a physical model of the Universe in which the fundamental building blocks are not point particles but rather one-dimensional "strings". According to this model, every fundamental particle exists as a different vibration mode of the string where each vibration has different associated properties. String theory arose, in part, as an attempt to bypass problems caused by the traditional model of point-like, zero-dimensional particles. Physicists had observed that the angular momentum of elementary particles was exactly proportional to the square of their energies. These results could not be explained using simple models that pictured these elementary particles as a set of smaller particles glued together, but could be explained under string theory. One of the most intriguing implications of string theory involves the existence of multiple dimensions beyond the three spatial dimensions (length, width, height) and the fourth temporal dimension (time). Applying the principles of string theory, physicists can expect a certain number of dimensions depending on the theory they choose. 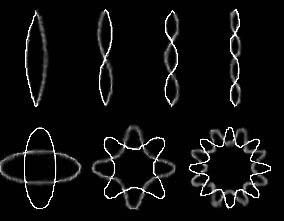 Superstring theory predicts 10 dimensions, while bosonic string theory predicts as many as 26 extra dimensions.